The fine folks at Pepsi continue to attempt to distinguish their brand image from Coca-cola's by offering up another uncommon flavor. Of course, this time, it's actually not particularly "uncommon" though since it is strawberry. Perhaps they have seen the lack of imagination at Nestle Japan with all of the strawberry KitKats and have decided to get themselves some of that boring, boring flavor action. Still, I have to give them props for offering up such a dainty label design and name. Women are definitely the demographic that sellers are gunning for in Japan these days, and why not? They're working more, marrying less, and throwing away disposable cash at an appreciable rate while the young men are cuddling anime-character-shaped pillows and waiting for robot girlfriends to become more affordable. Japanese women are traveling more and keeping what little of the economy that is still breathing alive. At any rate, since "pink" isn't actually a flavor, the bottle announces that this is "strawberry and milk". Never mind the fact that neither strawberries nor milk are in the ingredients list. I'm sure that some sort of artificial chemicals are in there which approximate the real deals and that they are cost-effective. There are a few listings for "flavoring" so I guess that's where it all comes from. This smells faintly like strawberry candy with a hint of bubblegum. Perhaps it is my imagination, but I'm beginning to sense bubblegum in every unusual soft drink I sample in Japan. I had my husband taste this and give me his impression before telling him mine, and he summed it up best of all by saying that it reminded him of a strawberry jellybean, though I must hasten to add that it's not as sweet or intense as one. It does also taste faintly of the essence of Pepsi, but it is a mere whisper in the background. The strawberry part delivers a sweetness punch, but the Pepsi element gives it a dry finish. This is not a bad combination at all. This tasted okay, but at 47 calories per 100 ml., I didn't drink the whole bottle. If I'm going to throw away nearly 250 calories, it's got to be on something more interesting than a Pepsified strawberry jellybean beverage. If you're a fan of fruity drinks which aren't too intensely fruity, this is certainly worth a sampling. It's not a revolutionary flavor, but it's also inoffensive and more interesting than the average strawberry drink thanks to the Pepsi influence. And I bet no one has spotted a Pepsi truck parked in a handicapped parking area...yet. 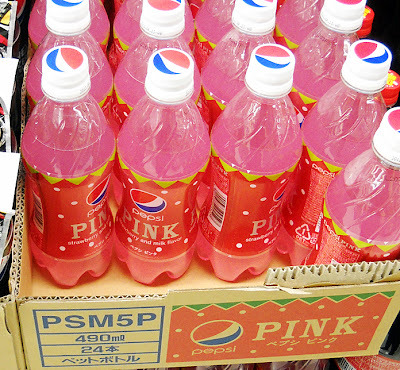 But, yeah, that hue of Pepsi is reminiscent of pink lemonade summer days.